Phnom Penh is composed of seven administrative "Districts" called "Khan" and is further divided into 76 local "Communes" called "Sangkat". 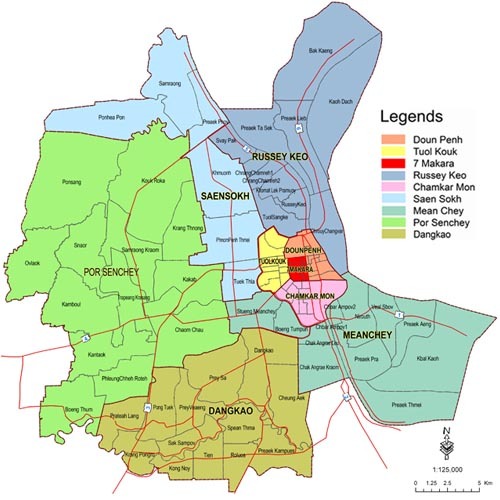 Especially, the urban area "Urban", which is familiar to foreigners, consists of four administrative districts —Doun Penh, Chamkarmorn and Toul Kork, centering on 7 Makara. Besides, this urban area is about 1/15 of the total area of Phnom Penh (about 5 km square), but gathers a population of 1/3. Moreover, as surrounding here, each administrative district such as Russei Keo, Mean Chey, Dang Kor is located. There is a "Toul Tom Poung Temple" along "Mao Tse Toung Street" running south of Phnom Penh. And "Psar Toul Tom Poung (Russian Market)" is located at a position slightly southward (between St. 155 and St. 163). 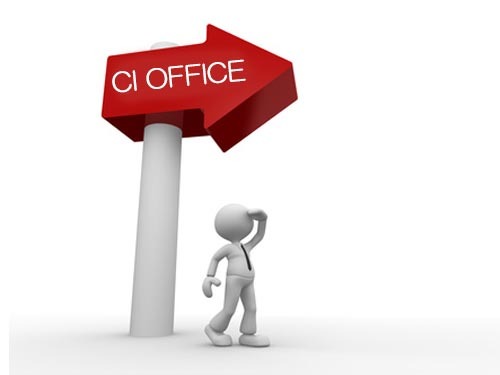 CI OFFICE is located at St. 472, which is 450 m further south of Psar Toul Tom Poung. This "Toul Tom Poung" area is an area where many Westerners live. And around this area, there are stylish cafes, restaurants, supermarkets where you can buy Japanese ingredients. Cambodian Impress Service Co., Ltd.